This is a beautiful curved sandy beach full of white sands located at the north western end of Langkawi and at the Datai Area. The beach stretches for about 1.5kms end-to-end in length taking a shape of a half moon. During normal tide, the beach is about 30 yards wide. Known locally as Pantai Teluk Datai, it is a private beach shared by couple of five star resorts - The Datai and The Andaman. From the road Jalan Datai and shortly after Andaman Resort, a narrow side road goes down the hill through a forested area all the way up to the Datai Bay Beach. 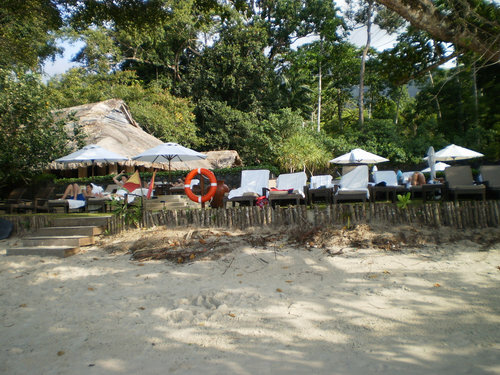 But at the entrance to the beach, there is a beach cafe and bar that belongs to The Datai Resort. So you can't get in unless you are a guest of the hotel or have a permission. I was fortunate once to have been a guest of The Datai Resort. When you want to go down to the beach, inform the reception and they organize a battery operated cart that takes you first by the main road and then down the narrow road all the way to the beach cafe. Look towards left and you will see the beach curving like a horseshoe and disappearing into a forested area. 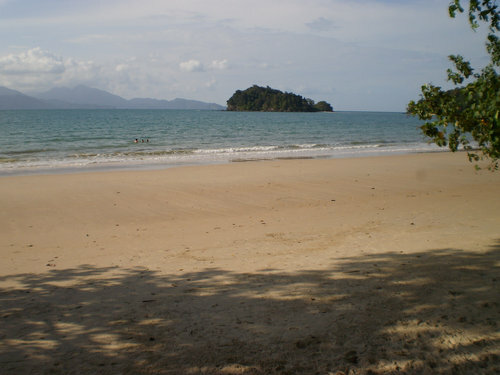 On the right the beach stretches to a long distance, makes a curvature and merges with the forested foothill of mount Mat Cincinang. The view of the mountain which is full of dense trees and descending all the way to the beach is awesome. On the right and far away you can see the other signature resort on the beach - The Andaman. The Datai Golf Course is also located close by and facing the bay. 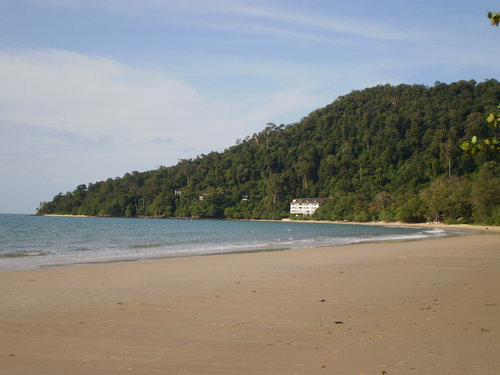 Datai Bay Beach is located at the Datai area at the north western end of Langkawi. Take a rental car or a taxi and drive along the road Jalan Datai (#161), go through the tunnel and past the resort Andaman, you will find a narrow road on the right that goes through a forested area with villas on both sides that belong to the Datai Resort. The only sign board on the main road is 'Gulai House' which is an Asian restaurant of Datai Resort located on the narrow downhill road and perched in a jungle setting. When you see the sign board, you know that you need to take a turn into that narrow side road. The beach is right at the end of this road. For entry, either you need to be a guest of the resort or must have a prior permission.